The Oust SPEED KLEEN Bearing Wash System is the fastest method for cleaning bearings with no damage to bearing races or carriages. SPEED KLEEN solvent is a biodegradable solution that easily washed away with water once the grease, oil and dirt is dissolved. Made in the USA. 5. Remove bearings from container and tap bearings on hard surface to remove all remaining orange cleaner and wipe bearings dry with towel, or dry with hair drier. 6. Re-lube after you are done cleaning. Use Oust MET-OL SPEED OIL (sold separately). 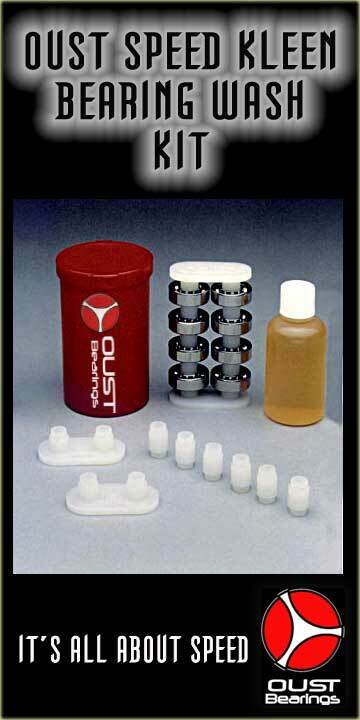 ADD LUBE: Relube after cleaning with genuine Oust Met-Ol Speed Lube for best performance. Choose "Add Lube" option when ordering.